It seems normal, now, for the first competitive game of the season to hold many unanswered questions. And with two key players, Morgan Schneiderlin and Nathaniel Clyne, being replaced by two unknown quantities in Cedric and Clasie, Southampton’s first dip into European competition since 2003 was no different. And the team provided the best possible answer by scoring 3 unanswered goals to take complete control of the tie. It was a strange and wonderful experience for Saints fans, who suddenly had new things to worry about and marvel over, like away goals, no booze and foreign referees with their fancy kits and deep tans. But European football should not have come as a surprise to the players, the majority of whom have played in European competition before. And so it was that this experience proved decisive; this was not an especially strong performance, but the players and manager found what was required to give Vitesse a huge uphill task in the second leg. Saints started nervously as the players slowly became acquainted with each other. Indeed, the first chance fell to Vitesse, who had an early shot that slid just wide of Stekelenberg’s post. 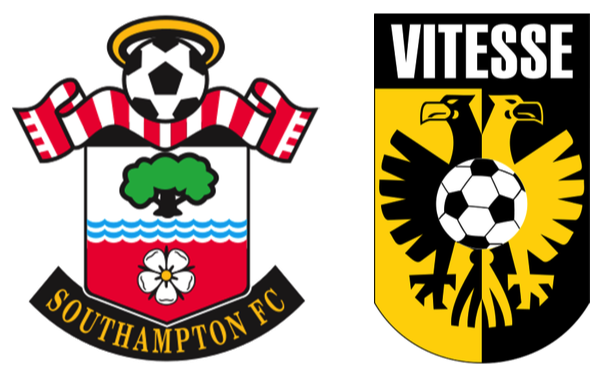 But Southampton did slowly gain control of the game and by the time Graziano Pelle hammered Saints into the lead on 36 minutes, Victor Wanyama had already started to dominate the midfield and Sadio Mane was already causing panic in the opposition defence. And it was another mayhem-inducing run from Mane which led to the penalty from which Saints made it 2–0 on the stroke of half time. After some signs last season, including the fastest Premier League hat-trick, Mane showed once again that he has all the attributes to become a player of the highest class. Quite apart from his pace and skill- which is often as mesmerising to watch from the stands as it must be to defend against- his work-rate is excellent and on occasion he made some important interventions to quell Vitesse attacks. And another new facet to his game was on display in this match; an ability to stay on his feet. Here is a young man that is learning the game, and improving, at an incredibly quick rate. Sadio Mane has the potential to outshine almost every Saints player that has gone before. Like Bale, he might just be stratosphere-bound. The answer to the Schneiderlin Conundrum did not come in the form of Clasie, his replacement in the No.4 shirt, but in the less obvious form of Victor Wanyama, who simply stepped up and took responsibility. He and Clasie revolved around each other in the centre of midfield, with the young Dutchman mostly remaining in the defensive position in front of the back 4 so that Victor could be more expansive. Not only did he fulfil last season’s role as the destroyer, but he also became the creator by playing short but incisive passes; he rarely looked for those poorly-executed sweeping passes which characterised his stuttering start in a Saints shirt. He kept it simple. At 2-0, Vitesse were allowed more possession in the second half and this almost became a problem when Jordy Clasie had to go off on 60 minutes. The midfield lost its balance and Vitesse found some chances. Stekelenburg was called on for the first time and made an excellent save. It was a wake-up call, but still Southampton could not regain control until two substitutes, Shane Long and Juanmi, combined for the third. Long found himself bearing down on the onrushing keeper and the loose ball fell to Juanmi, who calmly waited until Long found sufficient space, before placing an inch-perfect cross for Long to finish. It was a significantly impressive piece of work from the Spaniard and it sealed an equally impressive result in Saints’ first European outing of the season. On this measure, there will be many more.